Yesterday I talked about using Google Earth to get a sense for the grandeur of the huge, landscape-sized machines of experimental particle-physics. But Google Earth is also perfect for touring the holy sites of the other big science, astronomy, whether you want to check out the world's biggest telescopes or explore the stars. 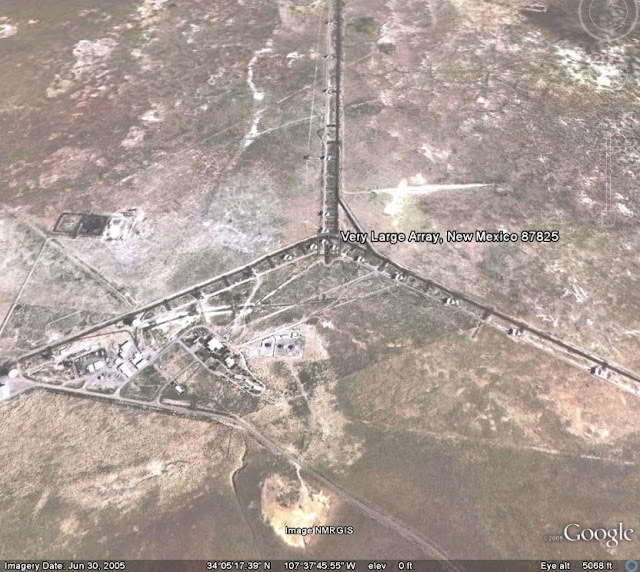 First stop: in the "Fly To" bar, type in "Very Large Array." Before you know it you'll be descending on a dusty, desolate patch of New Mexico that's home to 27 telescopes, each laden with a 25-meter-wide dish. The VLA is part of the National Radio Astronomy Observatory and "see" the universe in radio waves just as we see the world in visible light, allowing astronomers to study anything from the Cosmic Microwave Background to stellar corpses known as pulsars. 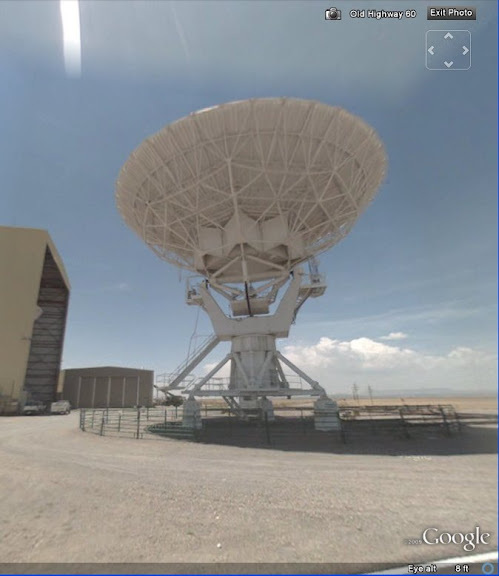 Some of the data collected by these telescopes has even found its way into Google Sky. The Very Large Array in New Mexico. Apparently the Google Maps truck barreled down at least on dusty road in the complex; enter one of the photo-bubbles and look around. You're standing at the edge of the array with one of the giant listeners looming over you, dish cocked to receive a message you can only guess at. Pretty impressive. One of the Very Large Array's telescopes, up close and personal. Next, click the "Add Content" button on the Places bar. This will open up a window in the bottom half of Google Earth that lets you search extra material. Search for "Chandra X-ray Observatory," download the file that comes up, and open it in Google Earth. It will become a folder under places. 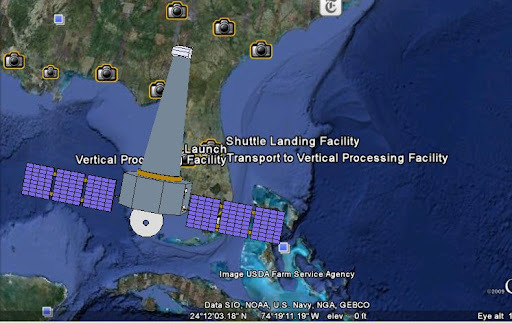 Double click, and you'll fly over to the air above Cape Canaveral, where you'll see the purple-winged (actually, they're solar panels)Chandra hovering. The Chandra X-Ray Observatory, hovering over the Kennedy Space Center. The scale isn't quite realistic—Chandra's elliptical orbit takes her to an altitude that's about a third of the way to the moon, and she's not always above Flordia—but it's convenient for zooming down onto the Kennedy Space Center just below her and checking out the launch pad. Now it's time to head down south. 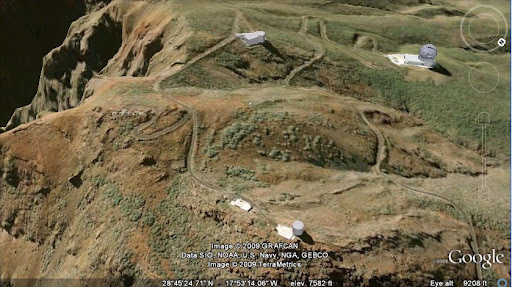 In the browser window, go to the Pierre Auger Observatory's Google Earth Page, where you can download a model of the cosmic-ray observatory and open it in Google Earth. Spanning an area of the Argentine Pampas that rivals the size of Paris, Pierre Auger uses 1600 water tanks to catch secondary particles from cosmic-ray showers. The Google Earth package is wonderful because you can really get a sense for the vastness of the enterprise, and how amazing it must be to stand on that desolate plain with the Andes looming in the distance. 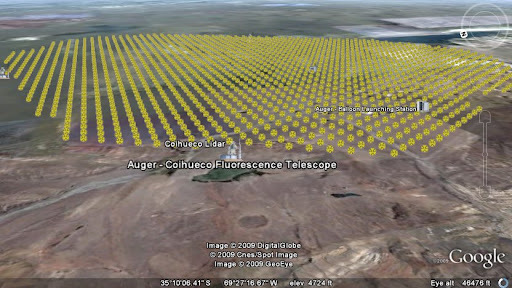 The 1600 cosmic-ray detectors of the Pierre Auger Observatory in Argentina. Tropical climes are next. Fly To Mauna Kea on the big island of Hawaii. Zoom in a bit and you'll likely see a cluster of enormous white domes: the Mauna Kea Observatory , home to the northern telescope of Gemini (the other is on the summit of Cerro Pachon in Chile) and the two telescopes of the KECK Observatory. In your "Layers" menu, turn on 3D buildings for a treat—the twin domes of KECK in 3D. The KECK Observatory's twin telescopes, on Mauna Kea, in Hawaii. Finally, "Fly To" Canary Islands and watch Chandra whip by as you zoom across North America to land in a remote, northeast corner of the Atlantic. Once you're there, "Fly To" Roque de los Muchachos, Canary Islands. When you land in a deep ravine covered in plant life, zoom out a bit. You'll spot a white dome in the upper left of your screen. Go to investigate—it's the Roque de los Muchachos Observatory, home to an impressive suite of telescopes, including the world's biggest optical eye on the sky, the Gran Canarias Telescope. 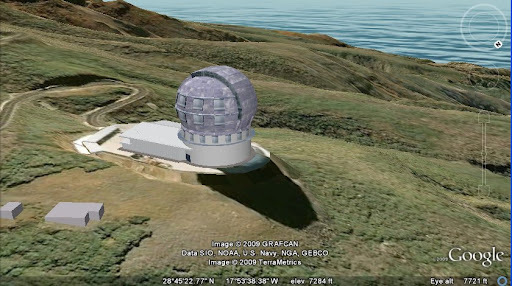 The telescopes of the Roque de los Muchachos Observatory on La Palma, Canary Islands. 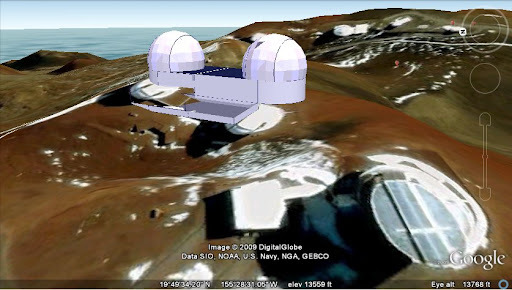 Plenty of the telescopes have been modeled in 3D, so make sure to turn on 3D Buildings. This shot of the Gran Canarias Telescope is as pretty as a painting. The Gran Canarias Telescope on its perch overlooking the Atlantic. Once you've had your fill of astronomy on earth, go to Google Sky, Moon, and Mars to do your own exploring. The one up at Mount Teide is also incredible. Being above cloud level is simply exhilarating. The Story Behind The Physics of Superheroes!